Hand picked Network Installation tool kits for Computer Network Technicians Reviewed. In this article we list and review computer network installation tool kits ranging from kits that include your crimping and termination tools through to LAN cable testers (from your basic Cat5 and Cat 5e cable testers through to Cat6 cable testers), and of course a whole lot more. At TheTechMentor.com we help computer techs and network technicians learn and earn more. I welcome additions to the list and any feedback good or bad in the comments below. Many years ago a friend of mine, smiled and said with a glint in his eye, “He who dies with the most tools, wins!” Read on and enjoy. Based on feedback to TheTechMentor.com I know many of you want to strengthen your knowledge in computer networking. I’ll throw in some extra ideas for you too. Note: US FTC law require sites tell you as an Amazon Associate we earn from qualifying purchases (we tell you this so you can decide how much weight to give our endorsement, though we aim to give enough information for you to make your own choice). Being an affiliate helps to keep this website online as many pages on this site just give free help. You don’t pay any extra (we prefer it if we can save you!). We love the Fluke Networks tool kits of course. If you can make the investment, the Fluke Networks MS2-TTK MicroScanner2 Network Cable Tester Kit with Punch Down Tool, Tone Generator and Probe will not disappoint. Quality and usability is what you get, and it has the major items without any network cables, cable boots or other consumables. It is practical to wear the key tools rather than carry them, with the Dur-a-Grip Pouch. The whole tool kit is supplied in a carry case or woven tool kit bag. If you get it with the woven tool kit bag, this is preferred as it has additional space for carrying more equipment and consumables). If you are a pro, then this is highly recommended! We suspect you know you want one of these too. Very helpful tool and if you are testing a lot of cables with long runs (or a big bundle of cables) then it is definitely worth the money. Several of our past students have grown their business by installing CCTV networks, especially high end high def quality camera networks for security purposes. This network installation tool kit is ideal for that. The professionalism it brings to the job saving you time and allowing for faster quality work, and boosting your reputation is worth it. The best in its category including not just the punch down tool and probe but also screw drivers and some consumables, the winner is the Premium UbiGear Network Tool Kit. There is pretty much everything included to make your own cables. Punch block tool, crimper, cable tester and consumables. Some feedback is that the overall feel of the kit while solid, is not so much a professional kit. Spring loaded rather than ratcheting grip can make a difference to some people. In the end we don’t see it as an issue if you are looking to buy network installation tool kit for low frequency use as a professional or for home. We say this because if for home you’ll find you can take the time regardless of whether or not you find it a little fiddly. you may find your skill level you can get it right in one go and don’t really need the ratchet mechanism. We don’t have an opinion either way. It’s good to know about it so you can decide. Some indicate it seems more for those installing only a few networks. Certainly satisfactory for those installing LAN networks in small workplaces or at home. Is the Premium Tester Worth it? The remote tester is the premium version and as expected ‘does the trick’ and is very helpful. Is it worth the money for the premium tester? We say we believe so. Overall this wins the award of best in class because everything does work fine and the price is excellent. More LAN Network Installation Tool Kits to Follow. If you’re an experienced network technician you might just want to skim down to the parts that interest you. You probably want to check the list to see what you don’t have yet and pick up any ideas to make what you’re already doing that much easier. I’m going to cover the essentials of what you need in a Computer network installation tool kit and present some of what I’d say are the best prepared kits available. Where it helps, I set out the features of each. I want to make this list a handy reference so network installers can share it. So if you are an expert and I’ve left something out, please add it in the comments below. This way this can be a growing, dynamic and updated reference. Similarly if you are selling a different brand of tool kit; let everyone know. The more the merrier! I’m going to cover a broad range of equipment, so I’ll also go through some of the very handy network testers and some network extender tools. You are absolutely going to need a handheld network line tester and good options for a good meter are the Dr. Meter and any or all of the fluke networks tone generator and probe kits. I’ve already mentioned the FLuke MS2 (Micro Scanner 2), so lets continue with related cable tester kits first. Only for professionals, this kit is specifically for the following: locating and tracing cables with Fluke IntelliTone digital signalling technology; documenting residential cabling systems are defect-free and TIA-570B compliant; cable qualification testing to check it has the bandwidth to support voice, 10/100/1000 Ethernet, VoIP, or CATV; mapping wiring configuration with distance to faults (yes!). Of course you can also use it to test any copper cabling media (twisted-pair, coax, and audio cabling). I mentioned mapping wiring configuration. The CableIQ graphically maps wiring configuration and shows distance to faults with intelligent Wiremap & TDR. If you are a professional you will want to step up to the Fluke CableIQ functionality. As the kit price is well over a thousand dollars, this kit is only for professionals who know what they are doing. Having said that, you could target bigger and better paying clients with this if you buy and learn how to use it. If you want to only get the cable tester then, just get the tester and probe only. Fluke make great network technician tools including the MS2. Click to see more photos, pricing etc. (in a new tab). This kit is only for professionals. It is a subset of the bigger kit above. It is for the following: it displays cable length, wiremap, cable ID, and distance to fault on one screen (you really want this!) detecting 10/100/1000 Ethernet, POTS, and PoE; locating any cable or wire pair with Fluke IntelliTone digital and analog toning; testing all common cable types, including RJ11, RJ45, Coax (with no adapters required). It has rubber molded enhanced grip with increased ruggedness. The magnetic strap attachment is handy to keep your hands free (and it keeps the tester safe from potential drops and accidents with the strong rare earth magnet). Pricing is also only for professionals and worth every cent IMO. This is a brilliant all-in-one computer network installation tool kit. Similarly if you are troubleshooting or providing ongoing maintenance, you will find everything you need in there as a network service tool kit. True it covers more tools than your network-specific tool kit, with a host of pliers screw drivers and more. It is supplied with the hard case in molded plastic. Of all the many-in-one kits, this would have to be one of the more popular tool kits among our colleagues. Important to note it does not have a network cable tester included. If you already have one that should be no problem. It makes a very handy collection but without the network cable tester it can’t win our best pick selection. At under 60 dollars (depending on where you find it) it can be great value. Check the price here. Installer Parts network tech toolkit – Click to open in another tab, more images and pricing. InstallerParts have a 15 Piece Network Installation Tool Kit and a 10 piece. The 15 piece toolkit includes a LAN Data Tester, 66 110 punch down tool, RJ11/45 crimper tool, 20-30 gauge wire stripper, 2 in 1 screwdriver and utility knife. They get plenty in the toolkit for the price. The hard case is very good, and looks great. It is both lightweight and durable as you’d expect. It forms a great kit because each tool is encased in a durable mold with heat formed inserts to hold them firmly in their place during transport. Tidy. In my opinion it is better than the soft cases with elastic (which can deteriorate after a few years). I have found that it is important to ensure that molded cases have somewhere to get your fingers in, so it is quick and easy to get leverage under the tool to prize it out. They have thought about that and well designed for it, so no problem there. So the case is a notable bonus. The knife and screwdriver are not considered the best quality by some, but you would not be buying this kit for the knife and screwdriver! All I will say is do not throw away your existing handy knife (or knives) and screwdriver set (of which you probably already have a good one) when you order this collection of tools . (If you disagree, please say so in the comments.) Having them there in the tool kit case will save you some effort to grab your better ones from another kit or separate tool bag from time to time I suppose. This is a great choice for someone only needing to use it for a few jobs, and a professional whose works on other things some of the time (i.e. not doing full time network installation). It’s been said the construction isn’t what you’d expect or demand from a professional kit that you use full time, and it makes some sense. The price already tells you that. I don’t want to be down on this tool kit, don’t get me wrong. They state it is professional grade, and I just want to state my view for a couple of minor parts so you are not surprised. Provided you know these things I predict you will be happy with it. What we can say is the kit overall is better than fair-value for network installation, network cable repair and so on. This kit is one of the cheapest for what you get. It has the necessary multi-function cable tester for testing telephone or network cables. It has 1 to 8 plus ground LED lights (9V battery needed, so make sure you have those handy already). Necessarily also include a professional network crimper. Looks solid enough, in the usual 6P, 8P 4P arrangement. As it is pretty low cost, you can use it to top up your existing network repair tool kit (we know tools can be lost on the job). Everything is there in this kit. It looks pretty similar to the other tool set above. It has a three pressure crimping pliers with the usual 6P 8P 4P arrangement. It contains a few crystal heads for a variety of cables. As per the image, it has the 468 network cable tester for automated testing, fast testing of satisfactory connections etc. It has the 501 stripping knife, and a whole lot more (click the image for a more detailed view on Amazon). All held together in a simple but functional fold and sip toolkit. The toolkit is typical for this price range with tools held in their unique place by elastic straps. This supplier I admit I am not that knowledgeable on, as we have not bought from them before. So if you buy, please do us all a favour and please let us know in the comments below how it goes. This Network Installation Tool kit is from MaxMoral. It includes LAN Network Cable Tester and a Professional quality Cable Crimper Tool. Plugs included are UTP Network Cat 6 and RJ45 connectors. Network cable connectors included are cable boots for RJ45 cable. The crimper tool is made with heavy duty hardened carbon steel, and crimps your cables in the usual 6P 8P 4P positions. It includes a stripper for either flat or round Cat5e and Cat6e cables. There is a pack of 20 cable connectors (in 5 colors). This one also doesn’t come with a carry case or tool bag. Which bag do we suggest to complete the tool kit? We recommend (and use) the Kenneth Cole Reaction Show Business Laptop Bag as this is where you can keep your laptop and immediate tools. It is a very professional looking tool kit, I believe. If you have to buy another tool kit just because there is no carry case included, then that drops our rating of the tool set. For that reason, it drops out of contention for the review prize. That said, it is great value for what it is. Sorry, that is it for now, as this article is a work in progress. We’ll flesh out the other tool kits we’ve looked at in the next few days. These tool kits are complete or multi-tool kits. 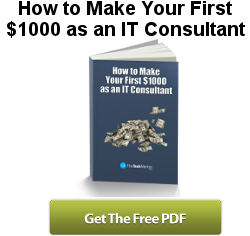 TheTechMentor.com has a very poplar post to help you build out a professional computer technician’s tool kit based on years of experience. Click that link to check it out now (it should open in a new tab). It contains handy links for all sort of technicians’ tools and network cables. You can pick out any tool individually. If you are searching specifically for a network cable tester, then this list sets one out for you among many other must-have tools. Do you have all the tools on that list (follow the above link to find out)? Remember, he who dies with the most tools, WINS! Oh wait, I did say I was going to provide some quick info for those wanting to get into doing more network installation and troubleshooting work. Are You New to Network Installation, Repair and Troubleshooting? If you’re looking for a toolkit because you are a beginner, you will be interested in getting started in computer networks and need some foundational understanding before you start trying to get some experience. See and view a clear and useful guide to making an Ethernet patch cable here (opens in a new tab). If you’re new to building your knowledge on computer networks then I recommend the CompTIA network plus book below (We have recommended Mike Meyers books before). It’s very handy and as typical the CompTIA study course covers a lot of the basic knowledge or foundational knowledge that you need. I know you may not intend to do exams and become a certified computer network technician. However, this book does provide worthwhile knowledge before (and as) you start cutting and crimping. For beginners, it is a book covering the basics and really is an essential network technician’s tool regardless of whether or not you intend to actually sit the CompTIA test. Mike Meyers’ CompTIA Network+ book is a great way to leapfrog your computer networking knowledge. If your are learning it belongs in your tool kit! Click the cover image to check it out on Amazon. Our favorite is the first one from Fluke Networks (which includes include one of the best network cable testers). It is a highly professional computer LAN network installation tool kit, with the best tools. Highly commended is the UbiGear Network installation and repair tool kit, and we regard it as the best in its class.